The charged weapon system has a lot of potential, and this first iteration really shows it. However, and of course there has to be a however, I feel that it's currently in a very scary, dangerous spot. Weapons in GRIP already had a very very high power level. A single weapon hit could quite feasibly cause 8 seconds or so of time loss which is, well, huge. The risk with charged weapons - currently at an even higher power level - is of effectively making races into slot machines. There was already a problem with leaders running away with races, but the now-increased ability of the pack to murder each other exacerbates it enormously leading to anyone who breaks free staying free more or less forever. I feel that the power level of charged weapons should be much closer to that of uncharged ones - with the focus being on providing flexibility rather than more raw strength. Scorpion - One of the biggest offenders IMO, the scorpion literally doubles in strength when charged. Firing two missiles means that a single target isn't safe even with a shield, while with multiple targets in play it can put two of them out of commission with a single firing. It's especially brutal in races with destructible cars, since two scorpions is enough to deal 60% damage to a speedster or mid class car, and 50% to dreadnought. This means that, with a lucky roll of the dice giving you two scorpions, you have the ability to instantly wipe out a racer not driving Tempest (which IMO has become almost entirely unviable on most tracks with the greater focus on aggression really targeting its inability to resist most attacks without having an accident) or Jugg. I think it would be best to drastically reduce the power of the missiles from the charged scorpion - both in blast effect and damage. 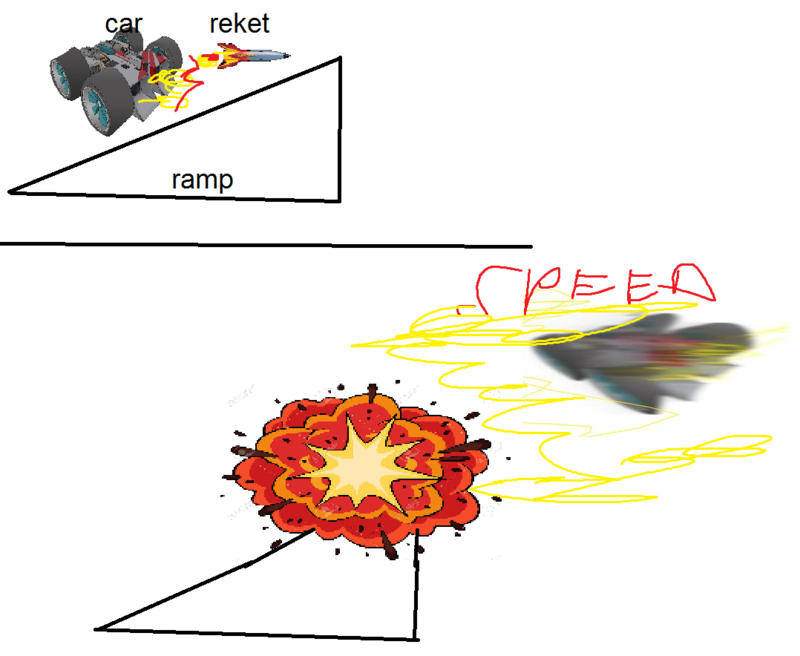 Ideally this would make it so that you could use a charged scorpion to knock down damaged shields with the first rocket, then still hit the target - or simply to hit multiple targets at once with a lighter effect. Meanwhile uncharged scorpions would remain useful for destroying fresh shields or when you really need to hit a single target. I imagine both variants would be similarly effective overall against single unshielded targets. Perhaps it could be taken further, with three of these much weaker rockets. Raptor - Probably the most boring charged weapon as of now, it just makes it almost completely impossible to fight against. If you have no shield and someone's behind you with a charged Raptor, welcome to the wall. No exceptions. There's very little visible difference between the charged and uncharged raptor for both the user and the victim, so it's not really spectacular either. I... honestly don't have a good suggestion here - there's not much that can be done to change the function of a minigun without it no longer resembling a minigun. Perhaps a higher-impact cannon? Instead of the rapid fire peppering, you get 4 big punches with a longer range but without enough total damage to kill a shield? Assassin - Kind of the same deal as the scorpion, but with some weird behaviour. I can't quite tell when it will decide to shoot at both 2nd and 1st, and when it will fire both missiles at 1st. Either way, this is a massive amount of raw power from a single pickup - again, double the impact of the original. What if charging assassins resulted in getting one of those fabled backwards-flying assassins? Rather than heading forwards around the track, it would travel the wrong way - allowing it to bypass shields and potentially getting a shorter flight time, but ending up with a longer flight time if the leader is already within sight. Ram Raider - This is for me the 'model' charged powerup. Its function is entirely different to the original weapon, being a long range 'sniping' tool rather than a close in defensive one. However, after playing with it in multiplayer - both using it and having it used against me - it's also on way too high a power level. It's not difficult to land hits with, and it applies absolutely massive amounts of force if you aim even remotely close to true. Seems to have a fairly large area of effect too. Its functionality is absolutely spot on, but its power level really needs to be brought down a fair amount. This was one of the more obnoxious weapons to go up against (and most powerful to use) thanks to its combination of immense range, great accuracy and huge impact. Spearhead - The base version of the spearhead is pretty strong already, with great accuracy and a somewhat inconsistent but potentially very strong effect. Charged spearhead however is crazy good. Not only does it both pierce and destroy shields, but the combination EMP and explosive effect means that you can be thrown off the road with no engine power to recover. It's nice that the EMP stops when you fall below a particular speed threshold, but if that has to kick in then the excessive amount of damage has already been done. I think it would be best if the charged spearhead lost its explosive effect and instead only applied the EMP - but still killed shields. This would mean that an uncharged one may be more useful against a target that's already without shield at a good time, while the charged one is effective as a combo with other weapons and against shielded targets. Firestorm - this is fine, nerfing the uncharged firestorm is a good move as the old iteration was easily the best powerup in the game and made things into a game of 'throw away everything so I can find more firestorms'. The charged version is much less practical for most situations, but can potentially provide massive time gain. Good dynamic - the charged variant is situational and clunky, so it's not necessarily right to just charge every firestorm you find. Hydra - cool, but a tad weak. The interface disruption effect is awesome but the usage scenario and basic results are exactly the same as the normal hydra, meaning that this is probably the least effective/worthwhile charged variant. Perhaps it could apply an interface distortion effect to cars that it passes by, similarly to an assassin? This would mean it remains not really worthwhile in situations where a normal hydra would work, but possibly quite handy to fire at targets as they're taking a corner or a tricky section of track. Disruptor - pretty inoffensive. The teleport forward is quite nice, but can catch you by surprise so there's an element of risk/reward to it. I have no beef with this one. Something else to consider is that there's no opportunity cost to holding onto charged powerups forever once they're charged. This means that it's almost always right to use any breathing space you come by to charge a ram raider/spearhead/scorpion so that you have it for whenever someone comes near you. Perhaps they should either lose their charge or disappear entirely after 20-30 seconds to discourage 'hoarding' of powerful pickups. Very well put, Mostly. I agree with everything that he's said. The charging mechanic in general is a cool idea, and I really like the idea of having different variants of the same weapon, but I think I fundamentally disagree with the concept of charged weapons being objectively better, or objectively better in all but some situations. I think the the intent of that design is sound, but the result is what made Rollcage Stage2's pickup system so boring. Even if an upgraded weapon is only slightly better, it's still better and will thus be the benchmark, obsoleting the unupgraded version, Or at the very least making the unupgraded version feel like a nerf bat, rather than the upgraded version feeling like a spiked bat. It's all about perspective. So with universally better charged weapons, instead of having twice the variety of weapons, you effectively have the same variety, but horrendously lopsided gameplay due to the run away arms-race. Now I have to acknowledge the "cost" of a charged weapon. That being a temporary loss of horsepower, as a justification for an objectively more powerful weapon. I don't think a temporary loss of power is a fair metric to balance weapons against because the effective cost of that loss of power is totally situational, as we so clearly saw with the EMP. Sometimes the EMP was utterly devastating, while other times it's an inconvenience, while the loss of power duration is exactly the same. I don't want to pass judgement on the entire concept too pre-emptively, and I want to see how this current system plays out in the championship races this weekend. However, I have a sneaking suspicion that the whole notion of charged weapons being objectively more powerful, justified by a situational cost, to be a dead-end road. Having different functionality and variety of the pickups for different situational use, is a GREAT idea. As an example; Firestorm, and its charged version works beautifully. Note that it's the only weapon that doesn't have a "Cost" outside of the time it takes to charge. I think all the other weapons should follow this example, and we'll have a much more interesting, and much more balanceable game. I still love the game and will wait to see how the broader community feels after more time spent on the track - my views may even change, they did for the boost and launch mechanics. If the weapon charge mechanic is kept why not tie it in to the boost meter too? In this way it becomes a more organic mechanic. The vehicles boost meter charges and the boost meter can then be used to boost your vehicle OR ad charge to your weapons. Ad this cost benefit proposition and I'm more inclined to like the idea (no need to effect momentum at all). As it is its a little mindless. Press, hold, charge, fire. And/Or you could tie the speed of the charge to the speed of the vehicle. So if I crash out and want to quickly charge the weapon in a situation that is more advantageous to me as the weapon holder, its going to take longer because I'm going slower (take away that advantage). If I've hit 1000ks it maybe costs a bit of speed but charges the weapon very rappidly. But I like option 1 don't mess with momentum but drain boost. On the contrary I think RC2 did a good job at ensuring pick-ups stacked versions aren't fired everytime ; the problem was more in how weak the non-stacked versions of some pick-ups were. The air compression pick-up was very weak in non-stacked version, same for the tazer one or the freezer one. The only pick-ups that were decent in non-stacked versions were Leader missile, driller, teleport and the paralyzer beam. Even time warp was very weak in non-stacked version. But this is not the case in GRIP - so far, each and every pick-up has a great functionality already when it's not charged. So at times, it will actually be more viable to fire it uncharged than firing it charged. Actually here we have the reverse problem - in RC2 base weapons are too weak, but in GRIP they're already strong enough, so the charged versions are a tad too powerful. That said, there's the problem that OP indicated - how you can keep the charged version forever, and use whatever "straight section" moment you have to charge all your pick-ups and then release them whenever you want. It requires some finger acrobacy but it's definitely possible and meta. A solution I would have is to force their release in a maximum of 5 seconds after they're done charging. Either that, or don't remove the speed penalty once it's charged. When it comes down to sheer power of charged versions in GRIP, I don't really mind it in non-destructible races. What's the difference between 1 scorpion and double scorpion when you have no shield ? You're screwed anyway and will most likely reset However, in destructible races, double scorpion is absolutely horrible, and I can already predict the next Championship race will end up being a survival race So yeah, balance is a bit off currently in terms of health damage I believe. That's for the health problem. For the knockout potential problem, I prefer having too much knockout potential rather than not enough. Maybe right now they are in an iteration of "too much". But at least it gives a bit more focus to weaponry and that's a great step forward imo. I am on the same page with mostly here. I think the charging mechanic itself is great. The Ramraider is the perfect example of a good charged pickup. It is outstandingly good where the base version is useless. The massively oversized hitbox aside i really like it. Other charged pickups, like the current scorpions, miniguns or assassins on the other hand just feel like they are placeholders and if they are going stay the way they currently are i will consider nothing but, sorry - lazy. Uncharged pickups are already very strong and just adding more power to them doesn't make them more interesting, on the contrary, the supersaturation leads to fatigue. It's an early implementation. There's plenty of room to fine-tune it, so calling it powercreep already is a bit premature. Being able to choose between 2 versions from 1 pickup à la Ram Raider is a very nice mechanic and I hope it's explored more rather than simply doubling missiles or making the raptor more effective. Regardless of the suggestions in mind (everyone knows where I stand), I agree with this and it's the start of where I personally see the beginning of a problem. I agree with this - what do you think of sacrificing boost instead? The mechanic might need to be changed to allow for weapons to be charged either fully or incrementally to accommodate the accumulating nature of boost. Still you would need a full charge to access the secondary fire feature. Natural speed and accumulated momentum are essential to the game - sacrificing them is not the right way to go for me. Broscar wrote: It's an early implementation. There's plenty of room to fine-tune it, so calling it powercreep already is a bit premature. I am giving feedback for the charged pickups in their current state and since currently everything except for the ramraider is just MOAR it is a powercreep to me. +1. It disrupts the flow of the game the same way the EMP did and why almost everybody thought it was annoying - gradual slowdown, except that it is slightly less prominent now. How about burning one weapon to ‘charge’ the other? Instead of just holding the charge button alone. ...Of the two weapon modes one should be offensive and the other defensive? I.e. missle charged feature could be to drop a mine, hydra secondary feature might be to fire backward... the player would always have a natural choice based on their position in a race. playabot wrote: I agree with this - what do you think of sacrificing boost instead? Boost in the mix is inconsistent to me: main reason is you can decide to play without! This would kill pickup mechanics instantly. Thus, the mechanics must NOT be tied to it imo. playabot wrote: How about burning one weapon to ‘charge’ the other? Instead of just holding the charge button alone. Elevates the importance of getting a pickup! playabot wrote: Of the two weapon modes one should be offensive and the other defensive? I.e. missle charged feature could be to drop a mine, hydra secondary feature might be to fire backward... the player would always have a natural choice based on their position in a race. Not so sure on the use change of the weapon from defensive to offensive. So yeah, its kind of a mix of charged and changed - but basically I think that there should be times where the base weapon is still the best for the situation. BTW, I still think holding input could drop items. I was looking at discord and people playing in teams would coordinate to be one behind the other and pass items along. Boy that would be so much fun !! Dropping could also be cool... I wonder if all of these ideas could interplay in some way?? - If you want to charge it wait until you reach the next pickup sphere and while driving through it hold the relevant button down to 'absorb' the energy into you're chosen weapon.